It became known for its exuberance, excess and glamour, but the Chelsea Arts Ball had a modest beginning in 1908 as an annual fundraiser for the newly founded Arts Club. By the time it moved to the Royal Albert Hall in 1910, its place in the London social calendar was set – and London’s art school students led the way. Held on New Year’s Eve, the Ball was given a new theme each year. Elaborately dressed art students represented their schools with extravagantly decorated floats that were driven directly into the Albert Hall, only to be destroyed by the revelers at the stroke of midnight. A short clip from Pathé’s archive, showing the 1954 ball in full swing, sets the scene. 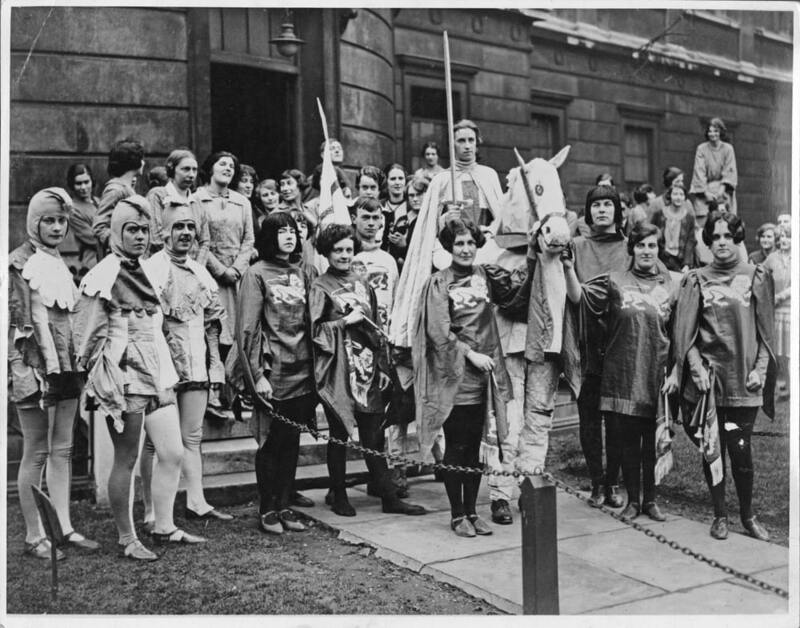 It’s hard to spot Slade students in the Pathé archive, but a generation earlier someone was savvy enough to take this photograph outside the Slade, as a group of students test run their gallant personas in preparation for the 1926 Ball. The label on the back of the photo doesn’t explain what theme is being enacted here (though we might hazard a guess), but it does identify one notable figure in the group: William Coldstream, who can be spotted by his fashionable symmetrical fringe (centre of photograph, left of horseman). Coldstream was a first-year student at the time of the 1926 ball. He would go on to marry (and later divorce) fellow student Nancy Sharp and, in 1937, co-found the influential Euston Road School with fellow Slade alumni Claude Rogers and Graham Bell. After service in the War, he worked briefly for the GPO Film Unit and taught at Camberwell College of Arts and Crafts before being appointed Slade Professor in 1949, a post he would hold until his retirement in 1975. We have done our best to ascertain permission to publish archive material. If you feel copyright has been breached please contact us. We will remove any items with copyright infringements immediately.